When we’re not face-to-face with friends and family (and sometimes, even when we are), we use chat and messaging to have “live” conversations. The desire for quick, real-time communication is seeping into our commercial correspondence as well—almost half of people in a Software Advice survey preferred live chat for online shopping questions. So what are people using for all this chatting and messaging? Facebook’s Messenger is a popular choice—it’s used by 600 million people worldwide to chat with their Facebook friends and contacts. Imagine if Messenger could give you the same instant access to your favorite business or retailer that you already have to your BFF? Facebook’s new Businesses on Messenger, announced today, will allow businesses to communicate with customers through Facebook’s popular messaging app for the first time. Consumers can choose to receive order information through Messenger and can use the app to directly contact the companies for quick answers and customer service. Not only is this great news for consumers—who tell us over and over that they expect to have a variety of options for connecting with the companies they do business with—but we at Zendesk are especially excited about our role here. Zendesk is partnering with Facebook to power the initial companies on Businesses on Messenger through an integration with our Zopim chat product. Online retailers zulily and Everlane are the first two companies using the integration to support their customers. 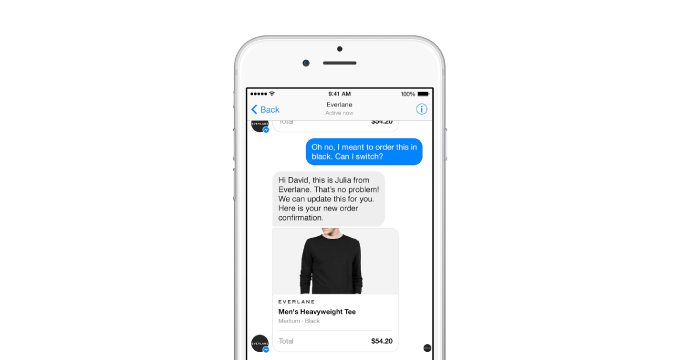 Their consumers can receive order information and interact with the companies through Messenger, while zulily and Everlane can engage with customers and manage support requests from Messenger using the same Zopim tools they already use for live chat. Businesses on Messenger gives businesses a new way for their customer service teams to offer support. With our integration, agents can use Zopim chat to also manage multiple Messenger chats at once, collaborate with one another to solve a customer’s issue, and access chat history to easily continue a conversation after a break. Businesses already are seeing the benefits of chat, including its efficiency. Chat agents can typically engage in as many as six simultaneous chats, depending on how complex the issues involved. Live chat is not only fast, it’s inexpensive. In fact, live chat is typically half the cost of a phone call center. This additional live chat support option could also help boost customer satisfaction: Consumers have reported the highest satisfaction rates on live chat (73%) as compared to traditional platforms like email (61%) or phone (44%). Our Zopim integration for Messenger will start rolling out in the coming weeks, and we’ll let you know when it becomes available to more business. This is a blog post about how to use live chat as a channel for customer service and/or sales support. Please visit Zendesk Chat, to learn more about Zendesk live chat software..